Fishing Cove ist ein voll ausgestatteten Achtbettzimmer Sechs Bad Uferpromenade familienfreundliche Haus in einem üppigen Pinienwald versteckt. Unser Ferienhaus am Wasser befindet sich auf einem sehr privaten Bucht mit 2 Hektar großen Anwesen am Wasser und einen großen privaten Dock und 3 Boot rutscht. Bequem mit dem Auto oder mit dem Boot von der Chesapeake Bay. Trinken Sie Ihren Kaffee am Morgen auf unserer 12 'x 72' Deck beobachten die Vögel und Rehe. Fisch und Krabben aus unserem Pier. Schwimmen Sie in unserem Pool. Unser grosses, einladendes Haus hat alles, was Sie für einen entspannten Urlaub an der Ostküste, einschließlich Eingabehilfen benötigen - Elektro-Rollstuhl Lift, Rampen und breite Erdgeschoss Türen. Das Hotel liegt am Angel Creek aus der Kleinen Choptank 9 Meilen von Cambridge, Maryland, wir sind in der Nähe von Blackwater National Wildlife Refuge, und unsere Küstenlinie zieht eine erstaunliche Vielfalt an Wasservögeln. Wir haben große Radfahren Straßen: Wohnung und landschaftlich, so bringen Sie Ihre Fahrräder. Bringen Sie Ihre Kanu und erkunden Sie die Küste. Das Haus ist wunderbar zu jeder Zeit des Jahres! Entschuldigung, wir können keine Hochzeiten, Hochzeitsempfänge oder große Gruppenveranstaltungen durchführen. Elektro-Rollstuhl Lift, Rampen, breite Erdgeschoss Türen. We booked a winter trip at the Fishing Cove. It was a fantastic property with room for all of us. Ginger was a more than accommodating host and answered all of my questions extremely quickly. I would definitely recommend this property and would love to go again. Thank you so much for the kind review. I'm glad you enjoyed your Fishing Cove weekend. Hope to have you as a guest again! Wonderful setting for family celebration! Thanks Patricia for the great review. I'm happy that you enjoyed your Thanksgiving at Fishing Cove! Great overall place. We spent our family reunion there with 10 adults and 6 kids. Only minor issues appropriate for age of the House. Bedroom setup is fantastic. We loved it! We had 13 people who stayed the whole time, and a couple that came in for visits. The place is spacious and has the "right stuff" (plenty of towels, kitchen utensils and appliances/equipment (2 fridges! ), games and puzzles, a great deck for reading, and, best of all, a swimming pool). We've stayed in a lot of places (in various areas), and this one had the best configuration with good furnishings. We didn't get to enjoy the big yard, because it rained every day there, but it would be a great play area for children (with mosquito repellant on). The heavy rain also meant that the crabbing was not great, but just wait until next year! The one suggestion I would make is to add some hooks to the doors to hang up towels. The host was very responsive and helpful, both before and during our visit. Thanks Mary! I'm glad you all had a good time at Fishing Cove. And Thanks for the suggestion about putting hooks on all the bathroom doors. I'll get on that right away! We treated our two adult children and their families to a week at Fishing Cove. There were 11 of us ranging in age from me and my husband in our seventies to our elementary age and young adult grandchildren. My 91 year old sister who lives about 90 minutes away came and spent one night with us also. She uses a walker and was able to navigate the deck, bedrooms and bath with no problem with her walker. There was tons of sleeping and outdoor deck and pool space for everyone. I am from MD originally and have extended family there, so throughout the week relatives came and visited us and there was plenty of room for guests. One of the best features of the house is the proximity of the pool to the house. It is literally right outside the door - across the deck and down three stairs. Swimmers and non-swimmers could visit together happily. The house was very clean and the kitchen updated and modern with tons of cooking equipment, dishes, and utensils. There was also a plentiful supply of towels for pool and bath alike. We do not have a pool at home and we found the pool equipment rather intimidating but on the other hand, all the automation meant that it was clean and in good shape for us. There were lots of insects - not so many mosquitoes, as house flies and some kind of biting fly. I realize that is unavoidable in that watery, rural environment but recommend religious use of insect repellent while outdoors. I don’t like the stuff much so paid for that by getting lots of itchy bites! That was minor compared to the pleasure we got out of this property. Indoor living space would be tight for large groups (say over a dozen) in cold weather when the outdoor living space could not be utilized. Other than that caveat I highly recommend this peaceful, quiet, lovely property! Lovely spot for a gathering of friends! Our book group (9 women) spent a delightful two nights at Fishing Cove House. The house easily accommodated the 9 of us with its variety of sleeping options, and enough bathrooms for minimal sharing. The house is very well equipped (new kitchen and appliances) with spaces for large and small group gatherings as well as quiet corners for individual reading. 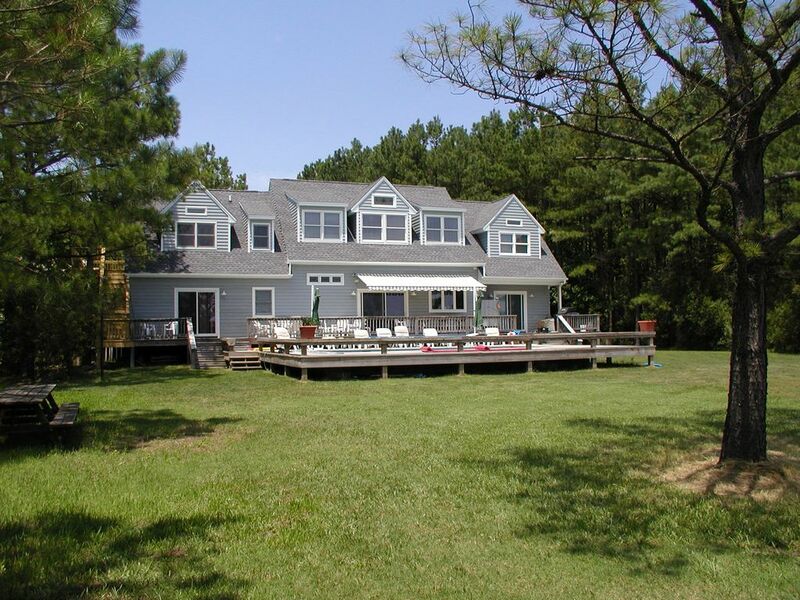 The location of the house is quiet and private, with great outdoor space with ample seating and lovely water views. All in all a very comfortable place in easy access (2 hours) from Washington DC. Thank you so much for your kind review. I'm glad you enjoyed the house. We are trying to do everything we can to make your stay pleaant. We hope you come again. Die Cambridge Lage ist das Herzstück der Chesapeake Bay-Bereich und ist eine bequeme Fahrt von New York, Philadelphia, Ohio und Florida. Familien versammeln aus diesen und anderen Bereichen, um alles, was die Bay genießen zu bieten hat - die Tierwelt, das Meer und den historischen Sehenswürdigkeiten. Es gibt auch gute Restaurants, Festivals, 2 Weltklasse am Wasser Golfplätze, Tennis und Bootfahren aller Art. Fischen, Krabben und Bootfahren könnte nicht besser sein. Gerade binden an unserem Steg und profitieren Sie von allem. Golf: The River Marsh Golf Club im Hyatt Regency Chesapeake Bay Resort bietet Golfern eine einsame Oase, um Golf zu genießen, wie es soll gespielt werden - mit klassischen Stil, breite Fairways, Bunker geformten, großzügige Greens und Tees zur Belohnung und Herausforderung auf allen Ebenen der Spieler. Das 17. Loch ist ein Par 3, die 200 Meter von den Spitzen erstreckt. Warten auf die mutigen Spieler ist eine dramatische Übertrag Shoal Creek zu einem großen Putting-Oberfläche von drei kunstvoll gefertigte Bunkern bewacht. Das Grün ist von majestätischen Bäumen und einer atemberaubenden Aussicht auf die breite Choptank Fluss, der in Chesapeake Bay fließt Backdrop. Clearview Golf Course at Horn Point ist eine Herausforderung und Spaß für jede Ebene Spieler. Sie werden bemerkenswerte Aussicht auf die schöne Choptank River genießen mehrerer Löcher auf dem Golfplatz. Dieser Par 72/73 Natürlich spielt auf knapp über 6450 Meter von den hinteren Tees. Mit Teichen, Fallen, von Bäumen gesäumten Fairways, schnelle Greens und festen, soliden Ballkontakt und Kurs-Management ist ein Muss. Credit Cards accepted with PayPal for 3% administrative fee. $2200 - $5800 per week.